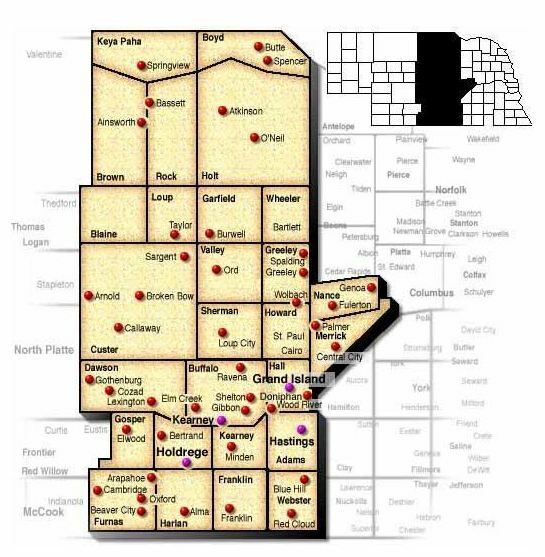 Our newspaper locator lets you search for newspapers in Nebraska by town, zip code and frequency of publication. You can also view newspapers within a particular zip code radius and view circulation information. Arapahoe Public Mirror Weekly 942 Furnas Central 420 Nebraska Ave.
Atkinson Graphic Weekly 1627 Holt Central 207 E. State St.
Bassett Rock Co. Leader Weekly 1179 Rock Central 118 Clark St.
Blue Hill Leader Weekly 1010 Webster Central 565 W. Gage St.
Cambridge Clarion Weekly 817 Furnas Central 706 Patterson St.
Central City Republican-Nonpareil Weekly 1820 Merrick Central 802 C Ave.
Franklin Co. Chronicle Weekly 998 Franklin Central 707 15th Ave.
Fullerton Nance Co. Journal Weekly 1232 Nance Central 416 4th St.
Genoa Leader-Times Weekly 560 Nance Central 524 Willard Ave.
Gibbon Reporter Weekly 576 Buffalo Central 113 C St.
Gothenburg Times Weekly 1953 Dawson Central 406 10th St.
Kearney Hub Daily 11731 Buffalo Central 13 E. 22 St.
Lexington Clipper-Herald Weekly 2033 Dawson Central 114 W. 5th St.
Loup City Sherman Co. Times Weekly 972 Sherman Central 822 ?O? St.
Minden Courier Weekly 1784 Kearney Central 429 N. Colorado Ave.
Ord Quiz Weekly 1991 Valley Central 305 South 16 St.
Palmer Journal Weekly 653 Merrick Central 916 Commercial St.
Ravenna News Weekly 1356 Buffalo Central 322 Grand Ave.
Shelton Clipper Weekly 543 Buffalo Central 113 C St.
Spalding Enterprise Weekly 676 Greeley Central 140 S. Cedar St.
Springview Herald Weekly 684 Keya Paha Central 102 S. Main St.